If you remember, a few days ago I introduced you to Tim Young and his amazing lifestyle. This is just for today (Tuesday 9/22), so don't hesitate. 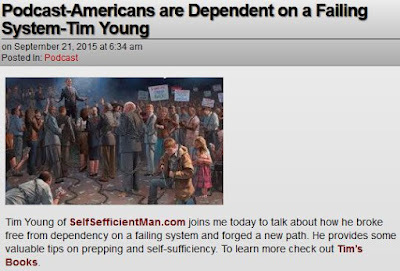 Tim also did an interview yesterday on the Prepper Recon Podcast with author Mark Goodwin. 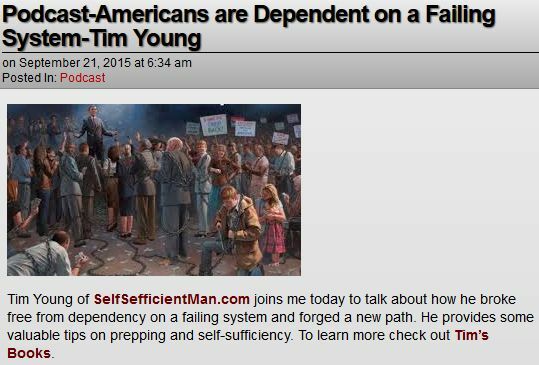 His talk is entitled Americans are Dependent on a Failing System (which I think you'll agree is true). Well worth listening. [UPDATE: A reader pointed out that "How to Make Money Homesteading" is $1.99, not $0.99. I inquired of Tim, and he replied: "It is. Amazon wouldn't let me set the price lower than that due to file size. :-( "
Thanks for the heads up! Heading there now. How to Make Money Homesteading is $1.99. The rest are $.99. Heh, pretty funny right there. Object lesson of the week.